Have you ever found yourself trying to explain your business to a potential client, but you’re not getting through? First, you start with concepts: “We use a proprietary process to optimize your management priorities for maximum buy-in.” Well, it might mean something to you, but probably not a lot to your listener. So, you try again. OK, a little better, but people still might not get it. After struggling with the “perfect words” to explain your business, with little result, you realize that concepts alone aren’t going to work; they are hard to relate to and you’ve missed the outcome. OK, that’s a lot better; the main idea of shifting from a top-down approach to a servant leadership approach is more interesting. And talking about outcomes also helps. But do prospects really understand this? Do they know how it works? What exactly is servant leadership? How are those outcomes achieved? All marketing is communication. So all of these are attempts to communicate some value that you offer clients. We’re discovering that concepts are limited and that examples or stories are better. But we leave out the most important thing of all. Visual communication. A picture is worth a thousand words. But what most small businesses don’t realize is that if you create a visual model for your business, your communication will start to connect in a whole new way. 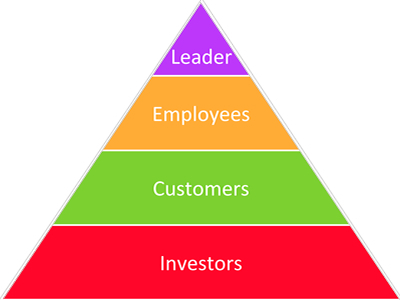 And then let me tell you: As you can see in this diagram, the leader is at the top and the customers are at the bottom. In this model, leadership is expected to know everything and then direct those below to take action. But this model has a lot of problems. It stifles feedback and participation, and productivity and morale suffer as a result. That makes sense, right? But notice how the image makes it so much clearer. 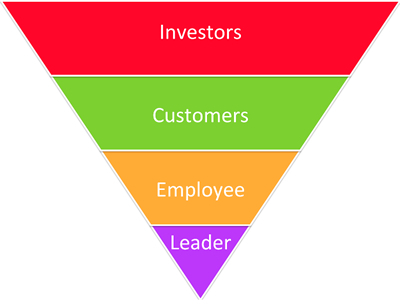 Let me tell you more: With this inverted pyramid, the shareholders, customers, and employees are at the top. They are offering ideas, feedback, and resources that the leader takes and works to develop, implement and support. The leader sees him or herself as a servant, not a dictator. This is how having and using a model helps communicate much more powerfully how you help your clients. Your prospective clients will get it faster, see the benefits and be interested in learning more. Of course, we learned this valuable lesson in “show-and-tell” in grade school, but then we grew up, became more sophisticated and relied more on concepts. Big mistake! This model simplifies things. 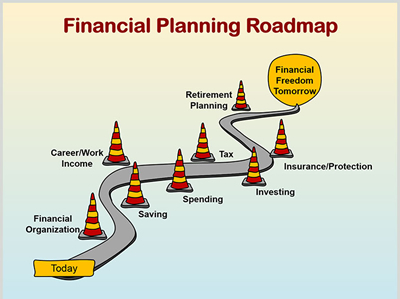 We all understand the concept of a roadmap and we know we can use it to figure out how to move from one place to another. That’s a pretty good explanation, but when you show the actual model as an image, it becomes even clearer and looks much more achievable. I developed this model about sixteen years ago and have been using it ever since. It’s much like the roadmap model, except that I also add the dimension of a game. I also use this model when coaching my clients on how to play Marketing Ball. When they finally see it as a game, they start playing more enthusiastically and winning many more new clients. You might start with the process you actually use with your clients, the process that helps your clients get the results they desire. Maybe this process is not too organized yet or all the pieces of the puzzle aren’t quite clear (a puzzle is a popular model, by the way), but with that start, you can begin fleshing out your model and ultimately turning it into some kind of a diagram. Don’t copy these models; use them for inspiration and to gain clarity. You need to understand how your model works, inside and out, and then test it to make sure it’s valid. 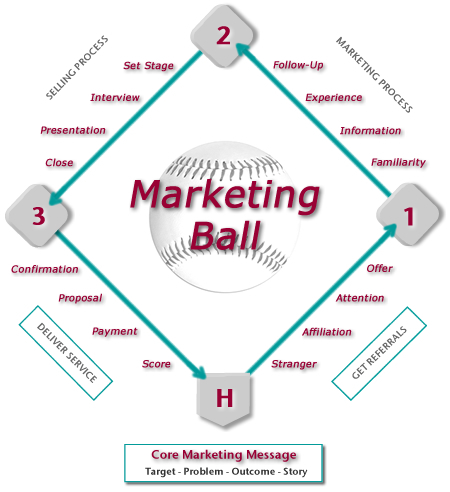 I created the Marketing Ball model while meeting with a client. The idea spontaneously popped into my head. So, don’t force your model. Write down some ideas and research existing models. Then start using your model in your marketing to assist you in explaining how and why this model can help them get the results they desire. You just may find that communicating about what you do and how you help your clients is easier than ever before.